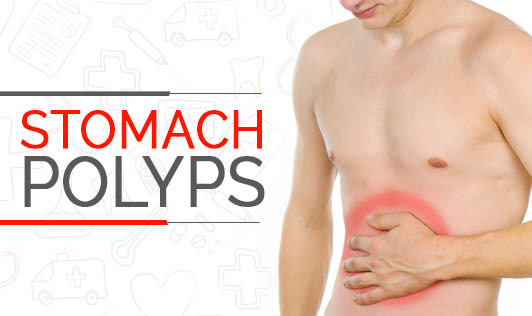 Stomach polyps are masses of cells that are formed on the inside lining of one's stomach. These polyps are often discovered when your doctor is examining you for some other reason as stomach polyps usually don't cause any signs or symptoms. Hyperplastic polyps - These are formed as a reaction to chronic inflammation in the cells that line the inside of the stomach. Hyperplastic polyps are common in people with stomach inflammation (gastritis). Fundic gland polyps - These are formed from the glandular cells on the inside lining of the stomach. Fundic gland polyps are rare and occur in people who have an inherited syndrome called familial adenomatous polyposis. These polyps are removed because they can become cancerous. Adenomas - These are the least common type of stomach polyps that are formed from the glandular cells on the inside lining of the stomach. Stomach polyps usually don't cause any signs or symptoms unless a stomach polyp enlarges. In very rare cases, the polyps may block the opening between your stomach and your small intestine. If you experience any signs or symptoms that worry you, contact your doctor at the earliest!